Upon his arrival to Blackpool Corporation Transport In 1933, Walter Luff looked at the fleet he inherited and decided that the replacement of the fleet of Toastrack trams running on the promenade was a priority. The main reason for the replacement was for the safety of the conductors who would be collecting the fares. As there was no central aisle, the conductor would have had to move along the running boards and hold on for dear life to the handrails along the outside of the trams to gather in fares whilst also trying to avoid colliding with trackside obstacles such as traction poles. Walter Luff's idea was for an open topped car with a centre entrance and central walkway for the conductor to collect the fares safely and to allow for safe boarding and disembarking for the passengers. The prototype 'luxury toastrack' numbered 225 arrived in 1933 and was immediately used in service and proved to be immensely popular with passenger and crew alike. A further 11 of these 'luxury toastracks', numbered 226 - 236 were ordered and soon arrived and were put into service. The Luxury Toastrack soon became known as the Boats due to them looking similar. Boat 225 had lower bodysides than the 11 production boats and gained the nickname 'Little Willy'. When the Boats entered service, they were allocated between 2 depots with 4 being based at Rigby Road for easy access to the prom for use on specials, whilst the remaining 8 were based at Marton Depot for use on the Circular and Coastal tours. During the period of the Second World war, the Boat Cars saw very little use as there wasn't as many holidaymakers in the town and the main priority was to ensure that the service trams and extras required were crewed. Following the war, as the visitors returned and the staff who had been called up returned, the boats returned to service. The circular tour did not return until 1957 so most of the tours operated along the coast from Tower to Little Bispham and south to Pleasure Beach, with the Boats featuring heavily on this tour. The Circular tours returned in 1957 for a brief period of 4 years operated by the boats until the Lytham Road route closed in 1961. From 1962 the boats operated once more on the Coastal tour route as well as on specials along the prom. In 1959, the Boat trams received their only modifications to date, when they received plastic windscreens on either end. In 1962, Marton Depot closed along with the route that it served, meaning a new home for the boats had to be found. The 8 Boats allocated to Marton Depot were transferred to Bispham Depot for the 1963 season. This move was short lived as Bispham Depot closed in October 1963. Due to there being less trams required following the closure of all the town routes, the decision was taken to withdraw four of the Boat Trams. 229, 231, 232 and 234 were stored in Blundell Street depot, where they were joined by the remaining 8 boats in service in time for the 1964 season. Early in 1968, stored Boats 229, 231, 232 and 234 scrapped in Blundell Street Depot having been stripped of useful parts first. The remaining Boats were renumbered 600 - 607 in 1968. In 1971, Boat 601, made a one way journey across the Atlantic, when it was sold to the Western Railway Museum, Suisun City, California. 601 still sees regular service there. 603 also made a trip to America in 1976, for the Philadelphia Bicentennial celebrations, returning to Blackpool in 1978. 603 never returned to service in Blackpool as it had been reguaged to 5ft 3 inches in Philadelphia and was sold to Muni in San Fransisco to operate on it's F line in 1984. 603 has been modified to carry wheelchair passengers and can only be driven from one end. 603 was renumbered back to 228 when it entered service with Muni. 600 spent a period on long term loan to Heaton Park Tramway in Manchester from 1984 (the initial part of this was to allow Manchester 765 to attend the Centenary celebrations in 1985). 600 had to have it's trolley tower removed to allow the tram to enter the depot at Heaton Park. Boat 606 became the first and to date only Blackpool Tram to run in Scotland in 1988, when it made the journey north to operate at the Glasgow Garden Festival. A special tramway was built through the Festival site and 606, in an attractive Blue and Yellow livery with adverts for Belhaven Beer on the side proved very popular with the visitors. 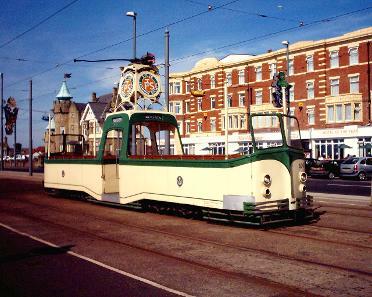 606 returned to Blackpool following the end of the festival in September 1988. In 1990, the Boats received new two piece windscreens to replace the original plastic screens as they were were beginning to suffer from scratch damage, reducing visibility for the driver. At the same time, boats were painted in a multitude of colourful liveries, 602 was painted in a very smart yellow and black 'handy bus' livery, similar to that carried by Blackpool Transport mini buses at the time. 604 was repainted into routemaster red and white livery, this matched balloon 701 which was also outshopped in this livery. 605 was painted into wartime livery (a fictitious but smart livery for this type of tram as the boats remained in original livery during the war), 606 was painted blue and yellow and 607 was painted yellow and green and covered with Travelcard adverts. In 1992, Boats 602 and 604 were fitted with pantographs with nylon ropes tied onto the current collectors to stop them falling off and hurting a passenger. 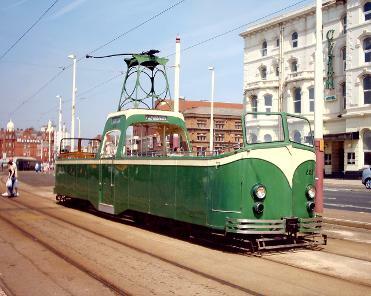 Although the addition of a pantograph made the boat trams look smart and cut down the amount of maintenance needed, they were soon converted back to trolley operation after Blackpool Transport received many complaints and compensation claims after passenger's clothes were showered with grease and dirt from the overhead line when it rained. Boat 604 lost it's red and white Routemaster livery sometime around 1996 and received 1990's Green and Cream livery. In 1998, boat 600 returned from long term loan to Heaton Park in Manchester. 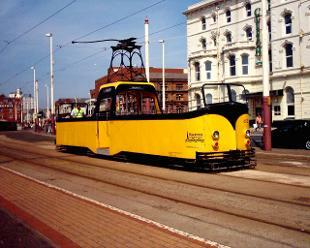 The tram was repainted into original livery and received Fylde Tramway Society roundels in it's trolley tower. Boat 606 made it's final journey in Blackpool in August 2000, when in an exchange for Blackpool Standard Car 147, which was in store at Trolleyville, Cleveland, Ohio in the USA, 606 made the long voyage by sea with 147 going the other way. Following the closure of Trolleyville, 606 moved to the National Capital Trolley Museum in Washington, where it is running, minus its trolley tower, due to the height of the overhead. In 2004 boat 600 was fitted with strings of lights just like during the illuminations in the 1950's and 60's. The fitting of these lights was done in preparation for the tram procession for the 70th Anniversary of the streamlined fleet, in which 600 was to take part. At the end of the 2004 season all boats were withdrawn as part of a fleet reduction exercise. Following a number of complaints and a huge outcry by the public, 600, 602, 604 and 605 were returned to service during 2005 proving just how popular this type of tram really is and that it's true that nothing beats a ride along the prom on a boat tram on a warm and sunny day, the only downside was that 607 never returned to service in Blackpool. In June 2008, 600 was repainted in its original livery and named "Duchess of Cornwall". During 2009, 600 received an overhaul. During this overhaul, 600 kept its original shape and features, however it lost its distinctive lifeguards, which were replaced with plastic skirts as per balloon 717 and was converted to low voltage operation with a control box mounted behind the tower. 602 and 604 were withdrawn for 2009 but both were later re-instated. 605 was preserved by the LTT and spent time on loan at Beamish before being bought by and moved to the Muni tramway in San Francisco, USA in 2013. 605 has since been repainted in 30's green and cream livery and renumbered back to it's original number, 233. During 2012, Boat 607 moved to Crich permanently, following a repaint back into 1930's livery, the removal of the windscreens and regaining its original number of 236. 607 is seeing regular service at Crich. In 2012 Boat 604 received a repaint into 60's green and cream, received its original fleet number of 230 and pictures of George Thornby in the roundels on the trolley tower and George Thornby nameplates and entered service with the heritage fleet. 602 followed suit in 2013, being reliveried in BCT red and white livery (unprototypical for a boat tram, but looks fantastic) and was renumbered 227. 227 is currently undergoing an interior refresh during 2017 with 230 having been stored awaiting the same treatment.